A few reminders about trade deadline day. First, expect it to be slow for long stretches, especially in the morning. Things will heat up in the afternoon as they always do. Second, if you're following along on Twitter, beware of fake insider accounts. Make sure you're retweeting @TSNBobMcKenzie, not @TSNBobbMcKenz1e. Anyways, back to the rumours. A new name in the rumour mill that could be on the move before the deadline tomorrow: Blues winger Scottie Upshall. 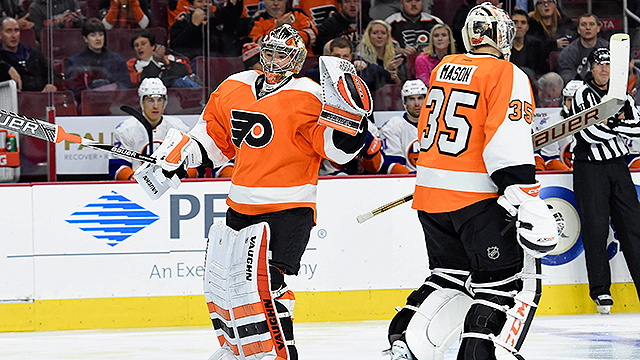 The Flyers are reportedly hoping to sign Michal Neuvirth. If that gets done, that might be the security the teams needs to deal Steve Mason. Or, failing that, Neuvirth could be the one that moves. The Sharks, Oilers and Flames are rumoured to be after goaltending, but Jaroslav Halak and Ryan Miller are other options. The Habs and Canucks might be working on a trade for scoring winger Jannik Hansen. The Canadiens might be reeling a bit after missing out on both Martin Hanzal and Alex Burrows. Crickets on the Jarome Iginla front at the moment - not that surprising given his $5 million dollar salary. But there's still time. The Avs have yet to make their first move, despite having been official sellers for several months. Stay tuned. Happy deadline eve everyone!